Sensataional CeremoniesCypress Grove Estate House operated by RW Events in Orlando is a majestic manor house nestled on a gorgeous lake just outside Orlando, Florida. It offers a wonderful gazebo on the lake with vistas that are unique in Central Florida. The property provides outstanding catering provided by Big City Catering, and enough room for large and small wedding parties and guests. Tenting is available for weather events at this mostly outside venue. The manor house does provide beautiful inside cocktail / reception space for smaller parties as well. Cristina and Nicholas selected this majestic location which was perfect for their one-hundred friends and family members. 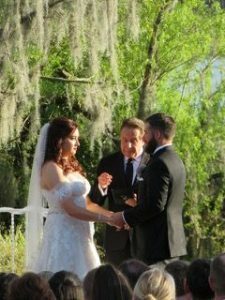 Lon Tosi of Celebration, Florida, from the Orlando team of Sensational Ceremonies worked with Nicholas and Cristina to create a unique and emotional wedding ceremony. They worked with a planning kit provided by Lon that provided many options for customization. After considering many options, they selected items that told their story. For instance, they wrote special words to each other that spoke of their deep love. Nicholas’ words were very emotional: He wrote of her accepting and open mind; her love of being part of “their” team. He highlighted that he felt comfortable with her and that he can count on her under any circumstances. She wrote about his selflessness and that he challenges her to push to the be best version of herself. Cristina loves the way that he treats his and her families. It is as plain as anyone could see that they are simple meant to be! Kristy Rapp Events did an amazing job in planning and coordinating this wonderful event! Kristy was there for the rehearsal as well as the ceremony and everything was so wonderfully planned and executed! Of course, the fantastic Jena from R DJ Rocks was on hand to provide the sound and ceremony music as well as the reception music and entertainment. Many fantastic vendors contributed to this event. Gian Carl Photography, and Baker’s Cottage Cakes among them. We want to wish you Cristina and Nicholas all the luck in the world with your marriage!